OCK Group Bhd, a telecommunications network service provider is scheduled to be listed in ACE Market of Bursa Malaysia on 17th July 2012. The Initial Public Offering (IPO) consists of public issues of 75 million new ordinary shares at an IPO price of RM0.36 per share at RM0.10 par value. Out of 75 million shares, 58.5 million shares are for private placement to selected investors, 7 million shares for application by Malaysian public and the remaining 9.5 million shares are made available to employees and persons who have contributed to the group. The IPO would raise RM27 million in proceed. Of the proceeds, 72 per cent will be equally divided for capital and operating expenditure, with 20 per cent will be allocated for working capital. The remaining eight per cent is for the listing exercise fee. The company is currently the biggest telecommunications network service provider in Malaysia in terms of revenue. Moving forward, OCK plans to venture into the emerging markets, which have strong potential growth in network deployment such as the Phillippines, Thailand, Cambodia, Myanmar and Indonesia. The company’s current order book stands at RM67 million, with about 60 to 70 per cent from the network service deployment business segment. More information regarding the company can be found in OCK Group Berhad webpage. Currently, OCK Group does not have any fixed dividend policy. The table below is the financial summary for OCK Group Bhd. Alliance Investment Banks is the advisor, sponsor, underwrite and placement agent while HwangDBS is the joint underwriter of the IPO. For those who are interested in OCK Group IPO, you may subscribe at ATM machines or via Internet Banking. The subscription period is opened until 6th July 2012 at 5pm. Tentative balloting date is on 10th July while the allotment date is on 13th July 2012. 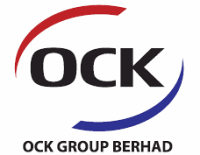 OCK Group stock name in Bursa Malaysia is “OCK”. View OCK Group prospectus in Bursa Malaysia webpage. What do you think about OCK Group IPO? Are you going to subscribe? Is this a good counter?